So, instead of doing anything fun last night, I cross-checked with Dulfy’s crafting list and updated the Spreadsheet of Doooom with the new orange Synthweaving schematics. There aren’t any new ones for Armormech (Edit: yes there are, see below). When you change an “n” to a “y”, it will turn green. The items that don’t exist are marked with “x”. As we know, sometimes the boots and gloves are a different level than the rest of the set, so for each set, I used the level requirement that is the highest of all items in that set. 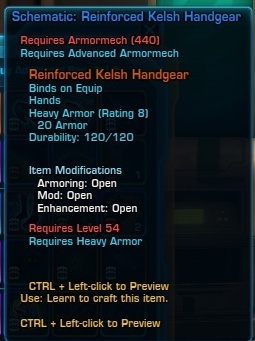 ***Edit: apparently there are new armormech schematics, probably added AFTER Dulfy posted. I found one last night. So I will be adding them to the chart the old-fashioned way: by finding them myself or searching the GTN to see what is available. I’ll add them to the spreadsheet as soon as I get the complete listing. ***Edit2: Guys, this is very strange. I can’t find any of the synth recipes on the GTN – meaning I don’t know what. Well it means I’ve wasted my damn time putting together a list, that’s what it means. As a practical matter the synthweaving recipes may not exist at all, and so far nobody has seen any armormech recipes, save for gloves, gloves, and more gloves. I got a new orange Armormech schematic last night, sorry I can’t remember what it is was called now (I’m @ work, boo). It had an armormech lvl req higher than 410 so I couldn’t learn it yet. It dropped from an Underworld trading mission. So more possibilities! Oooh! Maybe they added them in after Dulfy posted (this was, after all, on the PTS.) I’ll add the new armormech stuff to the sheet… just as soon as I figure out what it is. 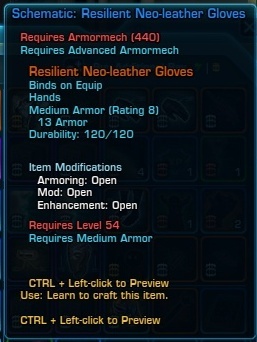 I’ve gotten 6 schematics now – but they are all gloves?! Haven’t seen anything else yet. I know on the PTS I got 1 for a chestpiece. Hopefully I’ll find something else soon. My minions will continue to be sent out until they bring me back everything I want. Those little jerks. Of the poll I am taking on Reddit seems gloves are the common appearance. Only 1 person so far as found anything else.